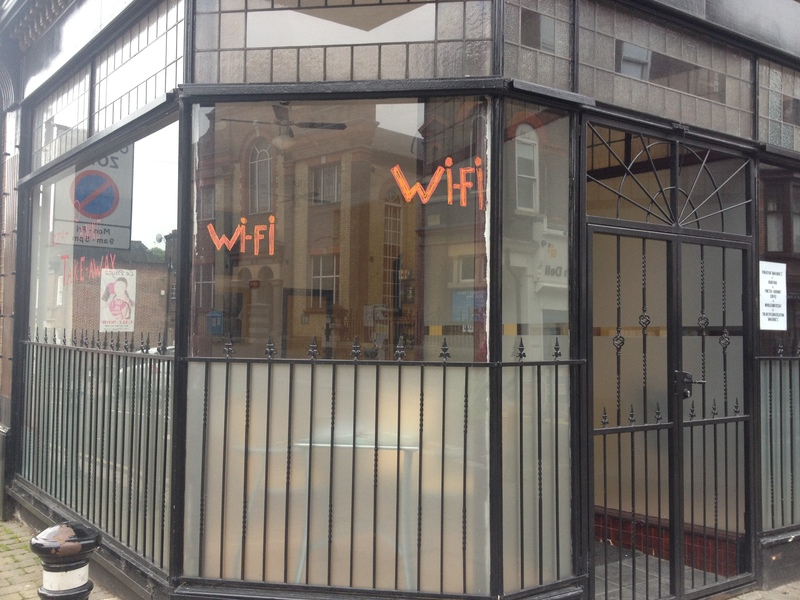 Before I start, I should mention that Marjorie’s, which I reviewed in an earlier post, has recently installed free wifi, the first of High Town’s eating establishments to do so. Most likely I can’t take any credit for this, but at any rate I’m very pleased. Just in case they’re reading, though: any chance of opening early to catch the commuter trade? To me it seems like a strangely overlooked opportunity that none of the cafés to this side of the train station opens to sell coffee in the morning. Tea at the Scandi: too weak for my tastes. Cups of tea at the Scandi are ever ready at the inflation-busting price of 55p, and I also ordered a cheese omelette with salad, for £6.00. Cups of tea aside, the food is not desperately cheap (local friend Grumbly Bob has complained that he can get a cheaper fry-up in the posher parts of London) or especially high-quality, although it is freshly cooked and delicious in its way. The Scandi is not an establishment that concerns itself with such matters as fairtrade, local produce, or animal welfare. Soya milk is not available on demand, and cappuccino is made from a packet rather than a Gaggia. Bread is uniformly Chorleywood Bread Process-ed, mostly white sliced, and chips are hot and plentiful, but not handmade. Salt, pepper (black) along with vinegar, brown sauce and ketchup are provided at the table, and there is a range of hot meals such as stews and roasts and cooked puddings, with pensioner specials but no student discounts. 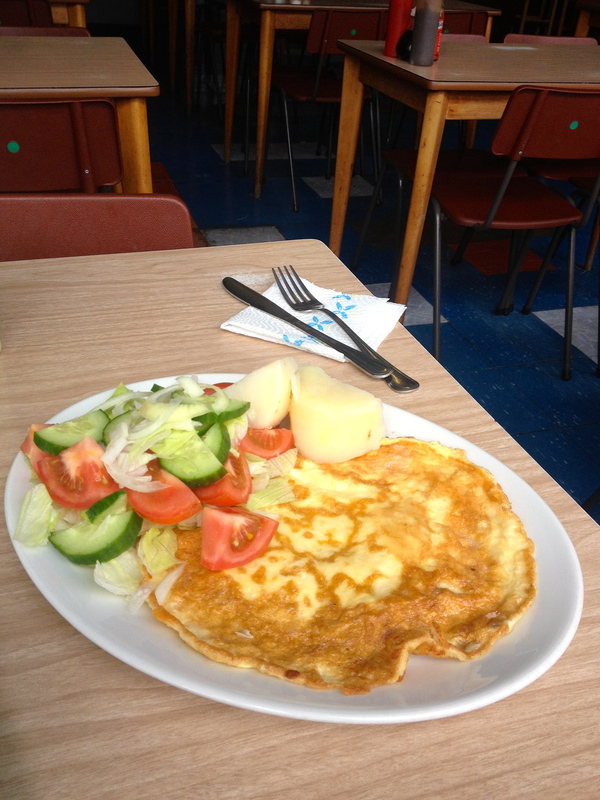 Cheese omelette and salad at the Scandi: deeply calorific but delicious. The omelettes are one of my guilty pleasures. I offer a small atonement to the god of weight control by swapping chips for a salad, which is variable in interest but fresh and plentiful. On the day I came here, it also unexpectedly included a couple of sizeable chunks of boiled potato to offset any pretensions I might have had to an Atkins-style diet. It will hardly surprise you to know that I have mixed feelings about the Scandi. In some ways I love it and it seems churlish to criticise it for not being something it doesn’t try to be. It is a High Town institution; the staff are unfailingly friendly and it is a remarkably good place to work (though no wifi, of course), even if it does feel a little incongruous to bring out a laptop. The radio is always tuned to a commercial ‘golden oldies’ station that would be an abomination in another context but is very acceptable here, cycling through the likes of The Kinks, Blondie and Chairmen of the Board. While nothing about the décor will ever be changed or updated (I counted 8 pictures of Elvis from where I was sitting), the place is well looked-after and clean. The 55p tea always disappoints, taste-wise (it’s very weak), but one can hardly argue with the price (unless, of course, one does want to argue precisely against low-cost and limited quality, which I think there’s scope to do in Luton). Powdered cappuccino available from the Scandi. As I’m taking a year out to write my PhD, I think I will be spending more time here in the future. It’s a good place to work in reasonable quiet and privacy with tea in hand. 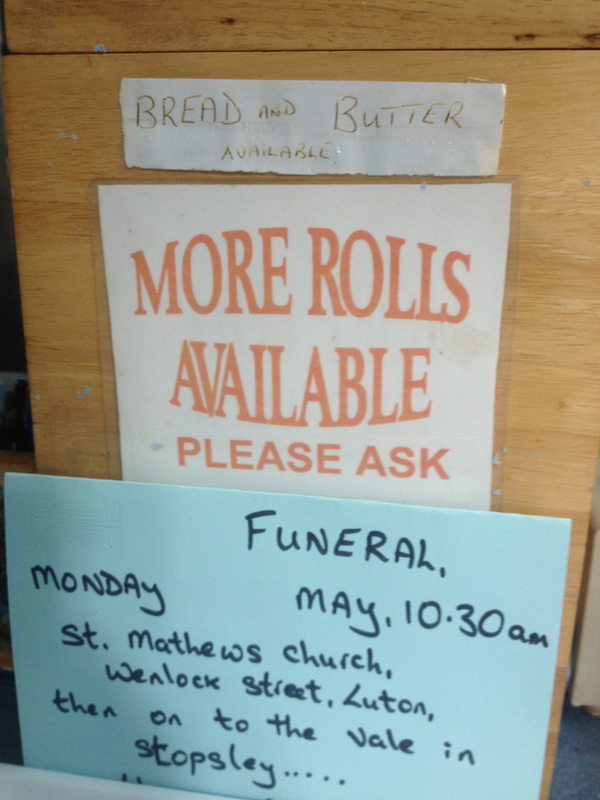 At the same time, it is striking that they have, on the whole, a very elderly clientèle (one of whom died recently – there was information about a forthcoming funeral), and I do wonder whether their business model is not rather self-limiting. Talk of business models seems rather out of place here, I know, but I do marvel at these long-standing businesses that seem to have no interest in developing their offer, customer-base or turnover. It is a wonderful world away from the excesses of Starbucks (who, rumour has it, have their eye on a site in the town centre), who maximise turnover and market-share even to the point of cannibalising their own business (eg. opening multiple branches on the same street), but the absolute unwillingness I see in some local businesses to engage with any notion of competitiveness or profitability is also quite an oddity. In some cases, I suspect that the owners simply own the premises as well as the business and are therefore neither constrained nor galvanised by quarterly rental rates. Now for Tim’s: I used to love Tim’s in its former venue, but I must say that its relocation to the indoor market has threated to dampen my enthusiasm. 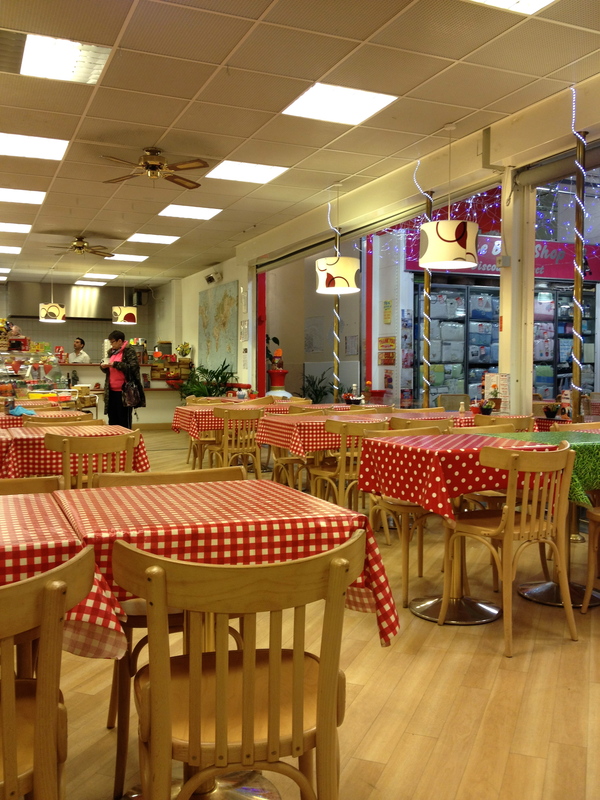 Why this should be, I cannot really say, since in neither location has Tim’s Kitchen ever benefited from such a thing as a window, or natural light, and in point of fact Tim’s Kitchen is now bigger, with a nod toward ‘terrace’ seating (albeit within the confines of the indoor market). While I do champion the indoor market, I go there less often than I used to (it was a surprisingly private place to have lunch when I was working at the University of Bedfordshire), in part because it feels ‘out of my way’. 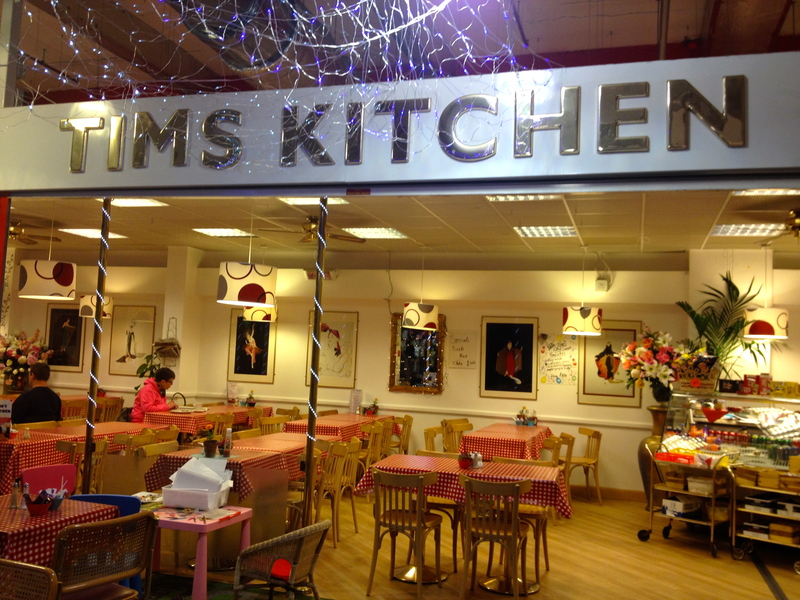 Tim’s Kitchen in the Arndale indoor market. Tim’s is a place I go to for cups of tea and toasted sandwiches, though I intended to make a fair comparison with the Scandi and order omelette. But omelette they do not do, so instead I had a jacket potato with tuna mayonnaise for a princely £3.90, and a mug of tea for £1.05. 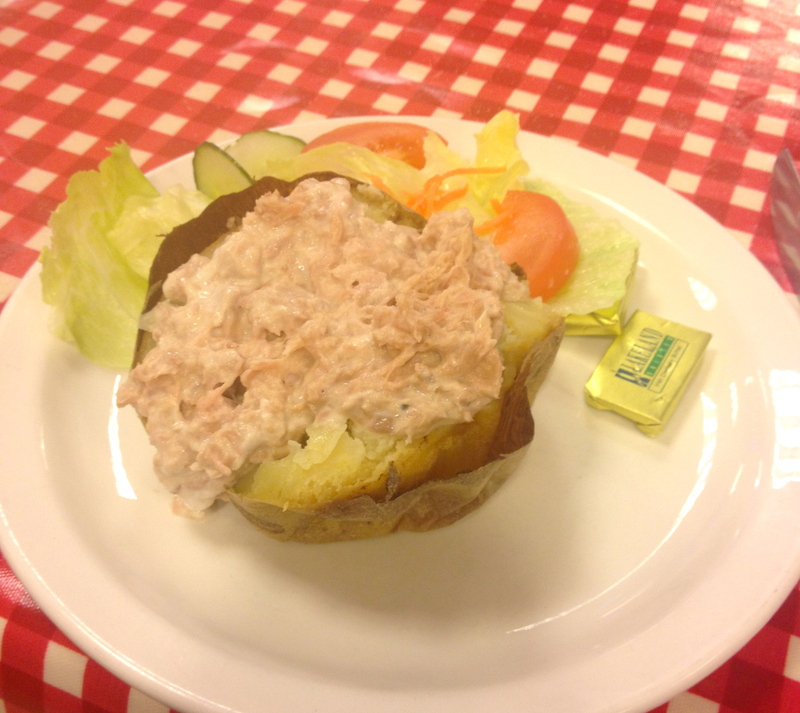 An acceptable jacket potato with tuna mayonnaise and salad at Tim’s Kitchen. Now. I had written an end to this blog post without having been more recently to Tim’s Kitchen, because I thought I knew what to expect (though I intended to go again and fill in the details). But then something unexpected, and even slightly magical, happened which has resulted in me having substantially to rewrite the review. Much as I like Tim’s, I expected a less pleasant experience than the one I had, chiefly because of its new location. 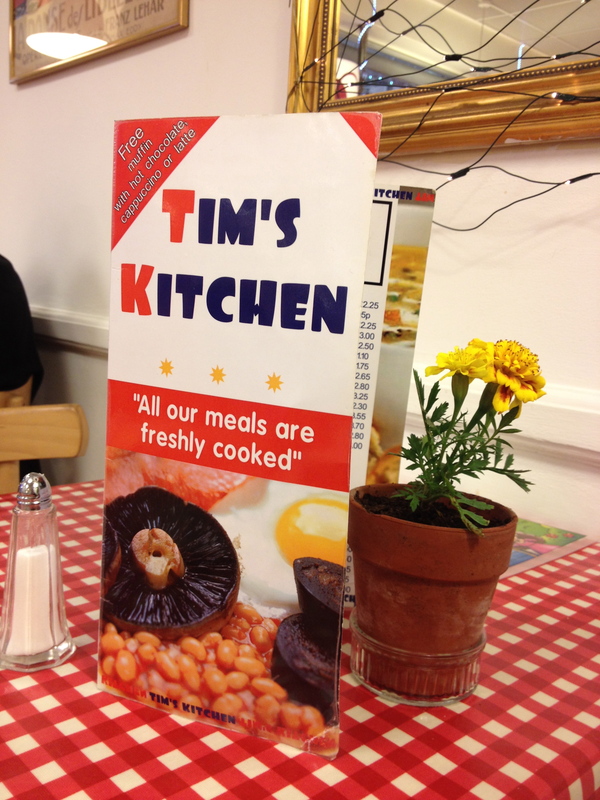 Yet the longer I spent there, the more I was struck by the remarkable effort that has gone into making Tim’s Kitchen a very pleasant place to eat. Tim’s Kitchen achieves a bright and spacious interior against the odds. Alone against the gloom of the surrounding market, Tim has managed to created a sunny oasis of surprising light and spaciousness. It is perhaps not the place to come with a hangover (it is very bright, but it is not the cold brightness of fluorescent lighting, but a combination of ceiling lights, fairy lights and a number of elegant downlighters). Tables are laid with vivid red gingham or polka dot oilcloths, and there is a quietly insistent gesture to a life beyond Luton: reproduction gilt mirrors, framed French revue posters from the Belle Époque; extravagant displays of silk flowers mounted on gold (painted) pedestals and tropical plants in each corner. The place is spotlessly clean (indeed I saw tables being wiped down with antibacterial cleaner). Greasy Spoon meets the Belle Époque in Tim’s Kitchen. There is also a quiet dynamism and gentility both to Tim (or the person I assume to be Tim, always there, running the show), and his Kitchen, that I rather appreciate. The food is consistently good (though again there is little interest in such niceties as real bread or fairtrade coffee), and I am reassured both by their 5* food hygiene rating and the visible preparation area. My jacket potato was tasty with an unexceptional but serviceable salad; the tea – twice the price of the Scandi’s, let us not forget – could also be stronger. They sell a wide range of take-away snacks (chocolate bars, fruit juices, etc.) and offer a selection of both sweet and savoury pancakes, which I’d really like to try. To my mind, it’s a real shame that Tim’s is now tucked away in the remotest corner of the indoor market, where it is very unlikely to attract much in the way of passing custom or new customers. Like the Scandi, it attracts the pensioner crowd, but I also saw greater a diversity of age and ethnicity, stemming, I think, from customers and traders from within the indoor market. I thought it would be noisier than it was, but there’s no radio in the café itself, and background noise from the market is minimal. There is, of course, no wifi. One might argue that, having gone as far as the corner with Marks & Spencer’s, one might as well head for The Coffee House (previously reviewed) and enjoy a decent cappuccino, free wifi and a toasted bagel in natural light and greater comfort. 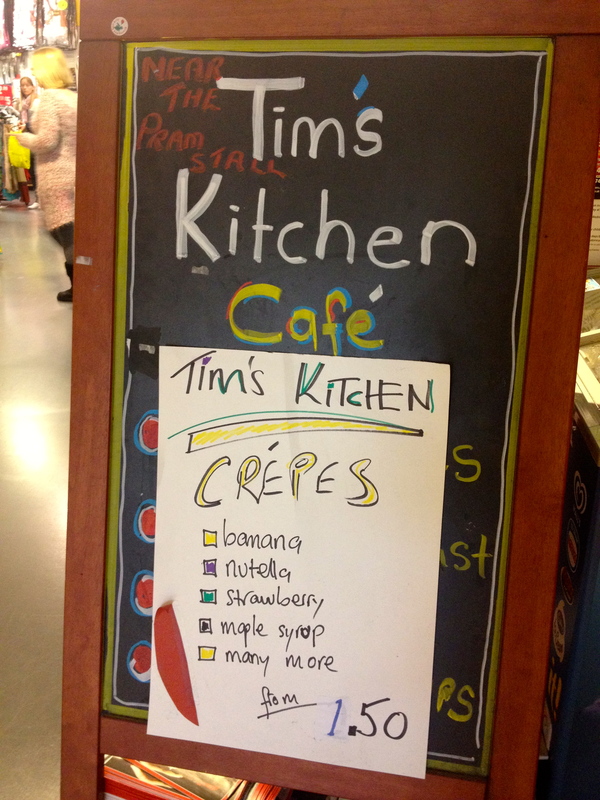 But Tim’s feels like a hidden gem, and I nevertheless recommend that you try it, if you haven’t already. There are a number of nice touches to Tim’s Kitchen that I really appreciate. And between Tim’s and the Scandi, well… that’s a tricky one. Given where I live, the Scandi is unquestionably more convenient, and I like the option of working by natural light. I can see myself spending some hours at the Scandi to work in a way that I can’t quite with Tim’s. On that basis, I think it’s a narrow win for the Scandi. So High Town is holding up well against the town centre (and Marjorie’s wifi could now tip the balance), but where next? Well, there are a number of places that I’d quite like to visit, out of interest and fairness, but where – I realise – I feel slightly inhibited due to a curious phenomenon which I am sure is not only Lutonian: namely, the sense that the place is really aimed at a particular community (ethnic, religious, linguistic) of which I am not a member. This puts me in something of a quandary, since I don’t want to make unfair assumptions (and clearly there’s nothing to stop me going in to any shop), and at the same time I don’t want to crash through a kind of ‘SQ’, or social intelligence, that recognises what may be valuable and useful in the cultivation of specific community spaces. In High Town, the Polish café (Siedemnastka), the North African ‘French’ pâtisserie, the Afro-Caribbean restaurant: I would love to drop by and spend my money in these places, but I’m not sure I’m completely welcome, not least as (in the first instance) there is no menu in English displayed outside or (as in the last) no menu displayed at all. And who goes into a restaurant that doesn’t display a menu on its window? 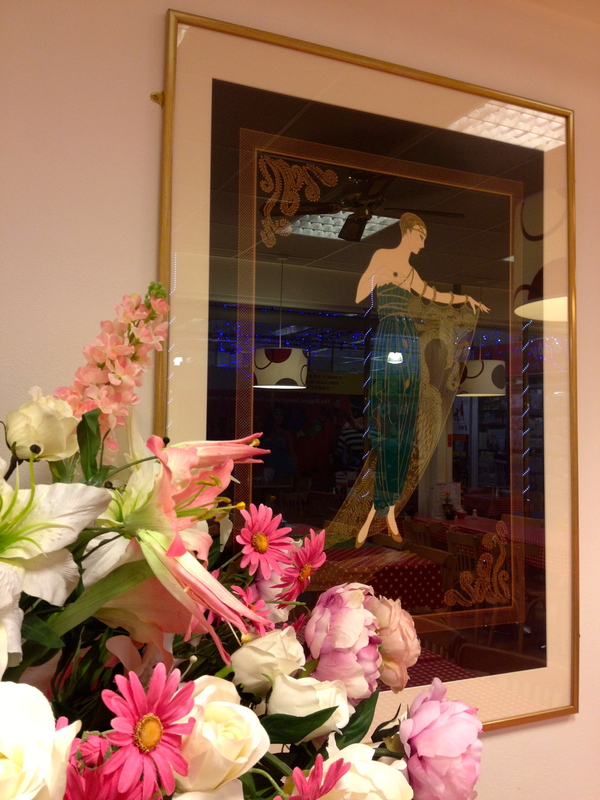 As for the pâtisserie, I’ve never seen a woman in there. I suspect that one way forward (and also as I’m a bit shy) will be to venture in with a friend at a quiet moment. So friends: join me for tea and cake in the coming weeks! This entry was posted in High Town, Luton Town Centre and tagged Arndale, café culture, Local friend Grumbly Bob, Marjorie's, Scandi, The Coffee House, The Knockouts, Tim's Kitchen, town centre by Cappuccino Police. Bookmark the permalink. Blimey.A comprehensive guide or wot? I’m truly out of touch with tea-on-the-go prices out there. £1.05 for a mug of tea. As you say some of these places transplanted into Hoxton High Street could easily be an enviable(?) oasis for many a hipster clone. Location, location, location (I hated that programme) I suppose. I once paid £10 for (a pot of) tea at a Sloane Square hotel (I was there for work, to meet a bigwig, and he has asked us to meet him there). The tea wasn’t very good, and we had to send it back more than once. 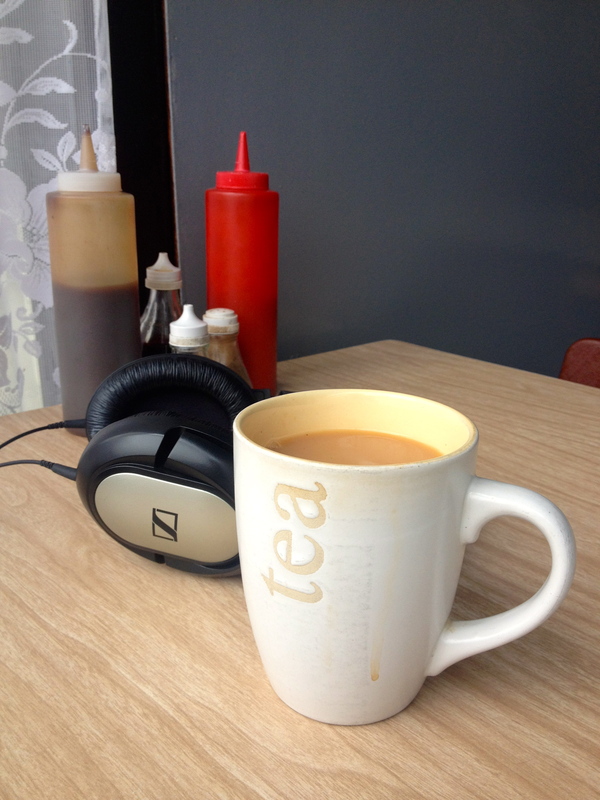 It’s a shame that the tea at the Scandi is so tasteless as I like the ready hospitality of tea from an urn. Didn’t there used to be a café where Tim’s is now, it was however not so roomy! 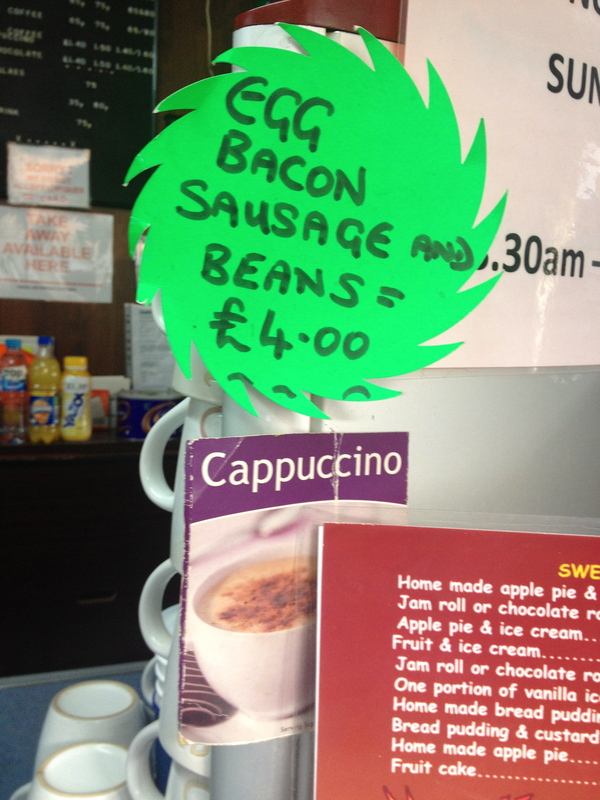 We had bacon sandwiches there last autumn on one of our visits from Sweden, and we were very satisfied. We will not try the Scandinavian restaurant.. We know we would be disappointed! The Scandi was once used in an ITV drama scripted by Lynda La Plante – the killer lived there. And the premises that Marjorie’s is now in was used in the film Colour Me Kubrick, starring John Malkovich, which used a number of Hightown locations, Carpet rolls were placed outside the Methodist Chapel and a scene was shot with Malkovich inside the Hightown Road chemist, which (if memory serves) was the culmination of a tracking shot which started with him coming out of what is now Marjorie’s. Colour Me Kubrick – which was based on a true story of a man who got away for years with claiming to be the great film director (and St Albans’ resident) in London restaurants etc – has, to the best of my knowledge, only ever had a UK showing at the Hat Factory. It’s not very good. Thanks for this comment, Keith! I knew about Colour Me Kubrick, though (having seen the reviews) I couldn’t quite bring myself to buy a copy (I should, though, just for the location shots). Didn’t know about the Lynda La Plante filming! I’m not sure Colour Me Kubrick ever got a UK DVD release to be honest, although it was released elsewhere in Europe. The North African cafe is great! The cakes are good, the coffee’s good and despite it appearing slightly intimidating, the guys are really friendly in there!